I don’t have asthma but am susceptible periodically to specific forms of hay fever. Some years are fine, other years a problem. In 2016 I was victim of thunderstorm asthma and had to take a day off. I had great difficulty breathing that night and had massive wheezing in my chest. When I went to the doctor in the morning, I was given a hot vapour at the doctor’s office plus Ventolin. I was also advised how to minimise the chances of getting it. After a day off from work I was fit enough to return to work. Unfortunately, I did not make notes at that time and have forgotten it. From what I recall, I was to take my anti-histamines regularly during the hayfever season. Plus I was to keep Ventolin with me to use as soon as the symptoms started. Today – 16 October 2018 – I’m feeling a bit of congestion in my lungs from the weather, and have taken Ventolin again + Telfast. 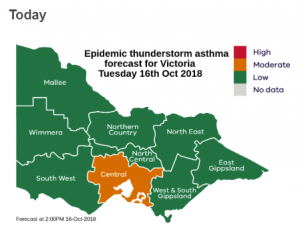 What is ‘thunderstorm asthma’ and what to do if you have it?